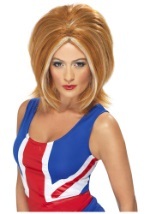 Get a refined look with this Posh Spice Wig. This brunette wig is 100% synthetic and styled in a chin-length bob with height at the back of the head. Caution: keep away from fire. You can look like Victoria, but you have to find your own pro soccer player!